massage therapy which is little known in Western culture. Simply put, the massage therapist walks on your back. The forces required to perform this massage technique are entirely generated by the force of gravity and the use of her body as a tool. She utilizes the toes, heels and balls of her feet to manipulate, stretch and open up the musculature of your chest, legs, buttocks, back and shoulders, thereby releasing tension which is stored along the regions of your spinal cord. To support and control her balance, she uses overhead parallel bars and, with the use of her arms, can decrease or, in some instances, increase the varying angles of down force or pressure required to achieve the release of rigid or constricted muscle tissue. The amount of force available with the feet is on the order of three times that of conventional hand and finger massages. CAI BEI' is an energetic massage technique, producing an ideal therapeutic bodily workout for people with a solid body structure. It helps to release tension and muscle contracture - producing an immediate sensation of relief and well-being and is especially therapeutic for people who are fatigued from high-stress or extended physical exertion, such as from sports. It is a perfect technique to be combined with other traditional massage therapies such as Chinese deep tissue or Swedish massage, for enhanced results. AMY was born in Heng Yang, Hu Nan, China. She was a mother and homemaker before coming to America in 2008. 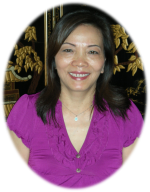 Since arriving in her new home, AMY was schooled in the Chinese profession of massage therapy and has applied those ancient artful skills to include such therapies as Chinese Relaxation, Deep Tissue, Tuī Ná and Hot Stones. AMY owned and operated her own business in Los Angeles before coming to Chico, Amy’s Massage. Wendy is very proud that Amy has chosen to provide her unique skills here in Chico… collaborating and sharing our beautiful massage facilities since 2010. Amy’s techniques in Caī Bei are world-class and, because of the increased pressures which may be applied, Cai Bei should only be requested if you are in good physical health.